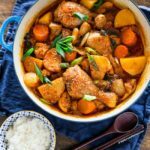 Super addictive and comforting, spicy Korean chicken stew recipe – Dak dori tang! Chunky chicken and potatoes are braised in spicy Korean sauce. The result is amazing! It’s so delicious and heart warming! It’s a perfect main dish to serve with steamed rice. Oh my my… It’s spring here. Living in a sub-tropical area means that I have pretty good weather all year around but every now and then we do get gusty windy weather. 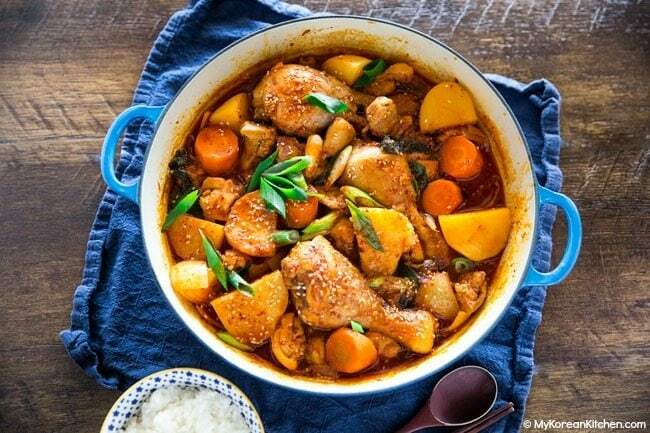 And, this spicy chicken stew is just perfect for those days. It’s spicy but at the same time, it warms you up and gives you comfort. If you like having stew on a cold wintry day, I will say add this menu on your repertoire! 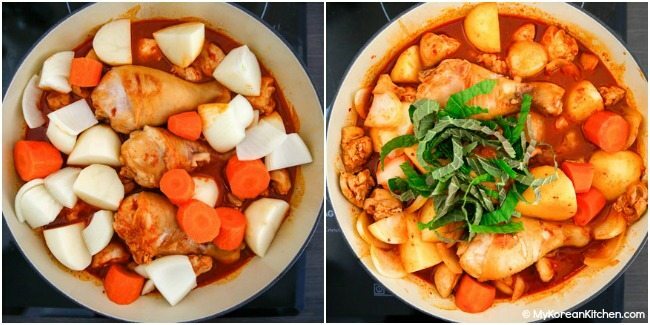 This spicy Korean chicken stew has many name tags under its belt – dakdoritang (닭도리탕), dakbokkeumtang (닭볶음탕) and dakmaeunjjim (닭매운찜). But, they all point to the same thing. Spicy chicken stew! This all happened since the Korean government (more specifically the National Institute of the Korean Language, 국립 국어원) has been trying to encourage the use of “real Korean words” as opposed to loan words. 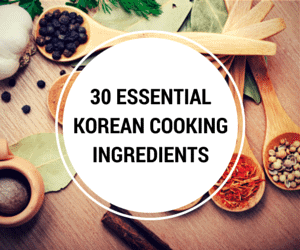 But the thing is old habits die hard and many people still call and search for dakdoritang / dak dori tang recipe! Now, back to my spicy chicken stew recipe. I originally posted the recipe in October 2006 and it was due for a new photo update. And, while I was doing so, I decided to moderate my original recipe as well, all for the best! My new sauce is adapted from my slow cooker spicy braised chicken recipe and the new cooking technique is adapted from my soy sauce braised chicken (jjimdak) recipe. They both are very delicious chicken recipes, so don’t forget to check them out too! Anyway, my spicy chicken stew recipe is really delicious. It’s quite addictive and moreish. Even my little girl loved it despite the spiciness. I Hope you enjoy my recipe too! 1. On medium-high heat, boil some water (5 to 6 cups) in a medium sized pot. Once it’s rolling boiling, parboil the chicken for 1 minute. Drain the water. 2. In a clean pot (I used this braising pot), add the chicken, sauce and the water. Boil them over medium-high heat for about 10 mins, covered. 3. Add the potatoes, carrots, and onions and boil for a further 7 mins, covered. Reduce the heat to medium and stir gently to change the position of the chicken and the vegetables. Add the perilla leaves. Simmer for a further 8 mins (or until the chicken and the potatoes are fully cooked), covered. 4. Garnish with the green onion and sesame seeds. Serve hot with a bowl of steamed rice. 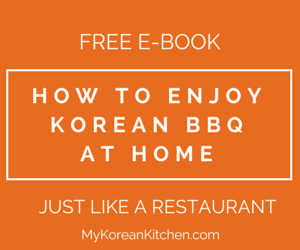 Easy Korean spicy chicken stew recipe. On medium-high heat, boil some water (5 to 6 cups) in a medium sized pot. Once it’s rolling boiling, parboil the chicken for 1 minute. Drain the water. In a clean pot, add the chicken, sauce and the water. Boil them over medium-high heat for about 10 mins, covered. Add the potatoes, carrots, and onions and boil for a further 7 mins, covered. Reduce the heat to medium and stir gently to change the position of the chicken and the vegetables. Add the perilla leaves. Simmer for a further 8 mins (or until the chicken and the potatoes are fully cooked), covered. Garnish with the green onion and sesame seeds. Serve hot with a bowl of steamed rice. Hello! I believe the “dang” part of the word comes from the Chinese word for soup. Are the perilla leaves essential? Not sure I could find in my grocery store. I have perilla oil. Would that be a reasonable substitute? In a pinch you can substitute Thai basil for perilla, or (so I’m told) European-style basil and a little fresh mint. Btw, can the leftover chicken stew be kept in the fridge/ freezer? There’s only me and my husband at home so even with 0.5 kg of chicken, coupled with the vegetables, the dish seems quite a lot for us to finish. I suppose you can. But I’ve never tried with pork or beef in this recipe, so I don’t know how the taste or texture will be different. For those of you wondering, I made this in my Instant Pot last night and it turned out wonderfully. Same ingredients as above but I added some mushrooms and half a cabbage sliced (needed more veggies). I akso cut the carrots into big 1 inch chunks to prevent them from collapsing. Put everything in the pot with about 3/4 cup of water. Mix to combine everything in the sauce and cook on high for 25 minutes. Could probably try 20 minutes next time for firmer meat and veggies, but it was delicious. Thanks for the recipe! that sounds great! what kind of mushrooms did you use? Did you parboil the chicken prior to putting it into the instant pot? This article is so informative as I often wondered what we call that dish–so many names and various versions. My mother-in-law and I just started a blog. Here’s our version here. It’s very homey and simple… no veggies just chicken. But the taste is great. This looks so delicious Sue! I’m a vegetarian, but I’m always looking for easy meals I can make my meat-loving boyfriend, and I think he would definitely adore this stew! Sounds perfect for those chilly fall days. And now I can use up the gochujaru that’s been sitting at the back of my fridge forever, yay! Any way I could make this in a slow cooker or Instapot? In case you don’t know, I’m a Korean too. And before you correct me, you should read my article more carefully because I included a reference that discusses 닭도리탕 and that it might be actually Korean words rather than borrowed (Japanese) words . In case you missed it, I will put a link here again. http://www.huffingtonpost.kr/2016/05/31/story_n_10216560.html Also here is another article talking about the same thing. http://www.nocutnews.co.kr/news/4601388. Hope these articles help your understanding better as they did for me. 🙂 Cheers. 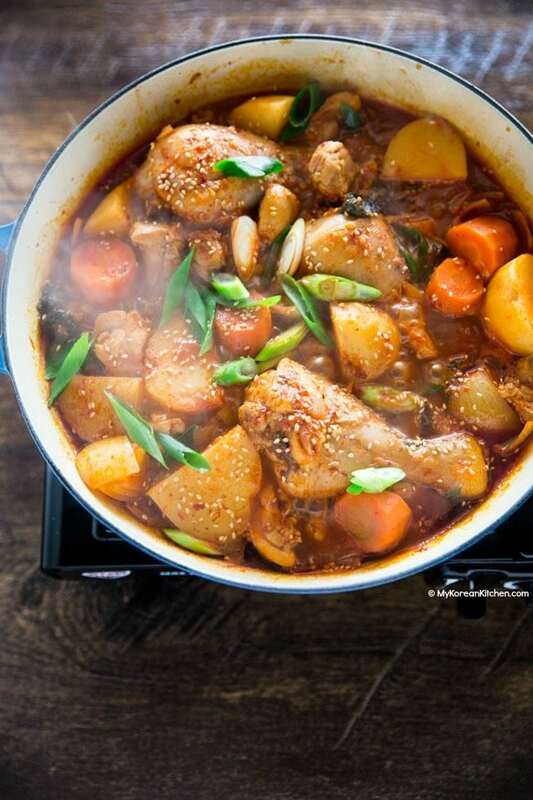 Oh my god,that chicken stew looks very awesome.I just want to have it right now.I will surely make it. I love this stew but can’t eat spicy so i can make it without the spicy chilies? Also do you have recipe for pancake. When I go to CA my daughter takes me to this Korean tofu restaurant and we order the pancake. Also the tofu soup without spicy. Hi Tess, I don’t know about your spice tolerance level, so maybe this recipe is better for you to be safe. 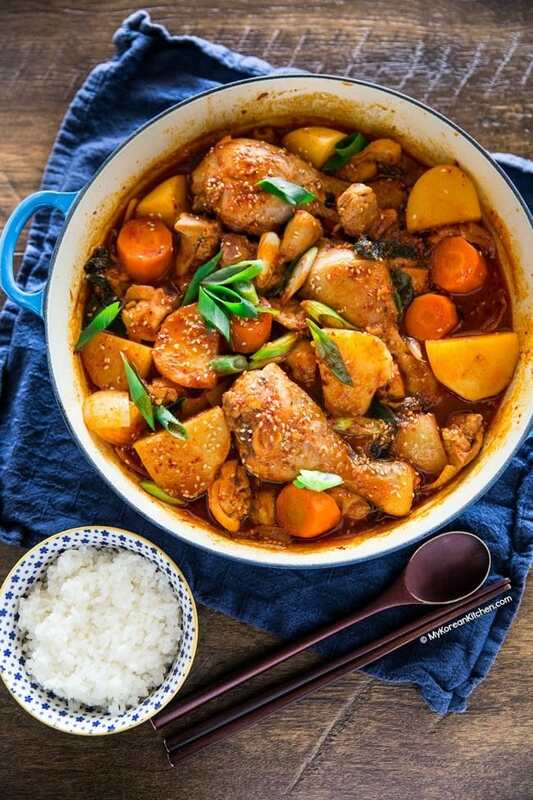 🙂 https://mykoreankitchen.com/jjimdak/ It’s a very similar dish to dakdoritang, but it uses soy sauce based non-spicy sauce. But, if you insist on making this recipe (dakdoritang), then I would reduce the chili flakes to start off with. But this could be still spicy for you. Delicious looking dish that I’m anxious to try. Thank you very much for listing Metric and American measurements. No problems! Hope you like my recipe. Enjoy! Looks fantastic, and really want to make this dish. but perilla leaves are not available here even in our local Asian market. Is there a decent substitute, or can I just omit the leaves. Hi Kathy, you can make it without perilla leaves. It will just lack that flavour, but it will be still tasty. Enjoy! It’s looking colourful, thanks for sharing this delicious dish. How would I modify this for instant pot? BUT on the recipe card, you say #2 “In a clean pot, add the chicken and the sauce. Boil them over medium-high heat for about 10 mins, covered.” NOTHING ABOUT “THE WATER,” WHICH YOU HAD US DRAIN IN STEP #1. WHICH IS CORRECT? PLEASE CLEAR UP THE QUESTION OF WATER, HOW MUCH, WHAT TO DO WITH IT, ETC. Hi Richard, the recipe card is now updated correctly. (It must have been my transposition error.) Thanks for pointing that out. Water to be used in the step 2 is 1 cup, as it is listed in the ingredient section. (There’s no change here.) I didn’t list the water amount used in the step 1 in the ingredient section (though it is listed in the instruction as a rough guideline.) Since this water is to be discarded. #1 calls for 5-6 cups of water to blanch the chicken pieces, this amount of water is mentioned incidentally in the cooking instructions and is not in the list of ingredients. #2 combines the water, sauce and chicken in a clean pot. I believe this is the 1 cup of water in the list of ingredients. I don’t believe the drained water in #1 is the water stated in #2. I see where this can be confusing as the first time I read it, it jumped out to me that I didn’t see 5-6 cups of water in the list of ingredients. 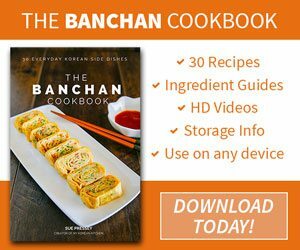 This my read on the recipe and I hope this may be of some help. By the way, the chicken came out great. This looks delicious, I will try it this weekend. I love perilla leaves, but often do not know how to use them. I have another favorite recipe that is similar idea but you brown the chicken on high heat first, then cook veggies, then add all together and simmer. My stove is unfortunate, a flat glass top and takes a long time to heat the ingredients up when I make large stew pot, it takes a very long time to reach boil unless using a small pot. Therefore, the browning helps reduce overall recipe time. 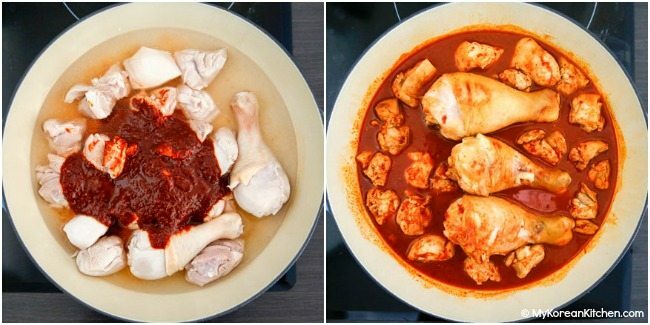 Have you ever tried the browning of the chicken instead of boiling/ do you think this would work here? thank you so much, I enjoy your receiving and making your authentic recipes. Hi Noelani, I often brown chicken (usually the thigh fillets) before I cook them in my oven. I do this to give a nicely seared color and also to give a slightly crispier texture. 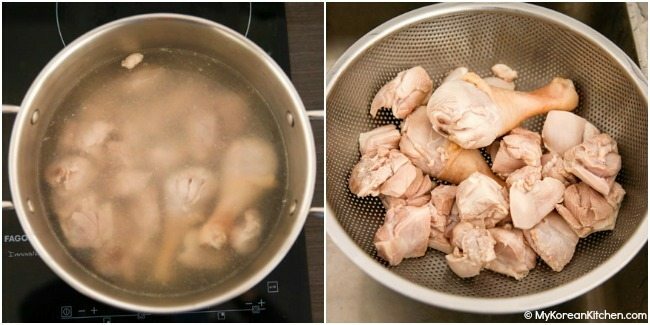 In this recipe, the main purpose of parboiling the chicken (only for 1 min here) is to make clear/cleaner broth (by drawing out any excess fat, for example), but not necessarily to cook the chicken faster.